Getting my children ready for photos with Santa and the Easter Bunny is one of the most stressful things. I always worry that they won’t be able to stay “happy”, completely dressed and most importantly…CLEAN, before the photo is snapped? Well, the folks at the Exton Square Mall and Cherry Hill Photo must be on the same wave length with me (an hundreds of other moms in Chester County) and have come up with a simple solution to eliminate waiting in line for a photo with the Easter Bunny. Introducing…. The Bunny Fast Pass! 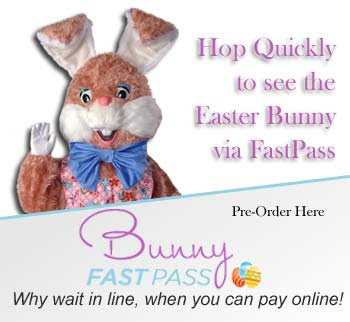 By purchasing a Bunny Fast Pass you will be able to bypass the regular line and hop on to the faster VIP entrance line. Now THAT is my kind of VIP line! Thank ya’ Easter Bunny! Monday-Saturday: 10am-8pm with carrot breaks from 1pm-2pm and 5pm-6pm and Sundays: 11am-6pm with a carrot break from 2pm-3pm.